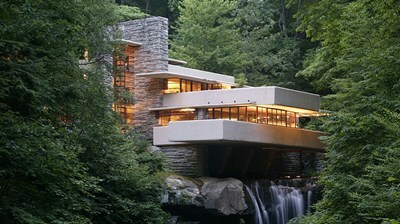 Fallingwater or Kaufmann Residence is a house designed by American architect Frank Lloyd Wright in 1935 in rural southwestern Pennsylvania, 50 miles southeast of Pittsburgh. The home was built partly over a waterfall on Bear Run in the Mill Run section of Stewart Township, Fayette County, Pennsylvania, in the Laurel Highlands of the Allegheny Mountains. 345 people want to do this. 33 people have done this. We have plans to visit this month.